As you might expect, the recently released version (6.2) of Docebo’s Cloud ‘As a Service’ E-Learning platform has some enhancements over previous versions. Chief among these are the ILT-Classroom and the Enterprise Cloud Solution Apps.That’s not to say that there was anything particularly sub-standard about Docebo version 6.1. At the beginning of this year, that version was named as seventh in the world’s top 50 learning management systems (LMSs), by the independent market analyst Craig Weiss, of E-Learning 24/7 who is, currently, corporate learning’s second most influential person in the world. But there are always improvements and enhancements that can be made – especially as technology develops and makes more things possible.Among his many observations about LMS buyers, Craig Weiss has noted that consumers are tired of paying high fees – arguing not just for more cost-effective LMSs but more flexibility in pricing, allowing users to vary the amount they pay according to the actual usage of the LMS rather than the number of users registered to use it. He has also said that vendors need to add features to their LMSs that consumers want and/or need. 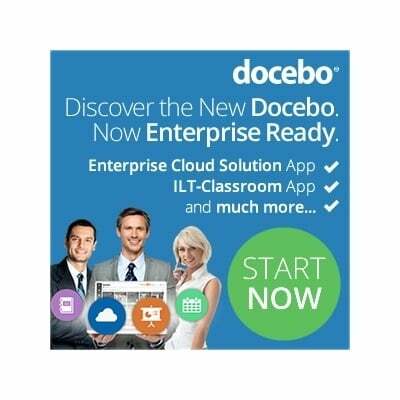 Docebo specifically addresses these issues with its new ILT-Classroom and the Enterprise Cloud Solution Apps.The Enterprise Cloud Solution offers users a new pricing plan which beings at 500 users and is available for up to 20,000 users. Apparently, those who opt for the Enterprise Cloud Solution can upgrade or downgrade their plan between 500 and 20,000 users as the need arises and their organizational circumstances dictate. For 20,000+ users, organizations will need to contact Docebo directly.In addition, the Enterprise Cloud Solution allows organizations to access an apps package including Help-desk Support, E-Commerce, Custom Domain, White-labeling, Https – including a classroom management app and other functionality.The ILT-Classroom App allows administrators and managers to schedule and manage their classroom-delivered, instructor-led training sessions in addition to all of the organization’s online learning activities. The App enables users to organize learning sessions; entire courses; classroom locations; learner enrollments, as well as learner assessments and evaluations. This App can also be used with Docebo 6.2’s Learning Plan App to schedule and manage an organization’s blended learning activities.Claudio Erba, Docebo’s CEO and Founder, believes that: “Our approach helps re-humanize business processes through e-learning as companies become more people-centric. That’s why we’ve allowed access to a package of Apps for mid-sized and large enterprises, such as the Enterprise Cloud Solution. In addition, our Classroom ILT App enables superior service delivery and cost-effective investment while leveraging the benefits and flexibility of a pure SaaS Solution.”With Craig Weiss stating that the average differential between the features of each of the 582 LMSs currently on the market is only ten per cent, Docebo hopes that its new ILT-Classroom and Enterprise Cloud Solution Apps will make that small but all-important difference for customers and potential customers.